Hi Mark here. 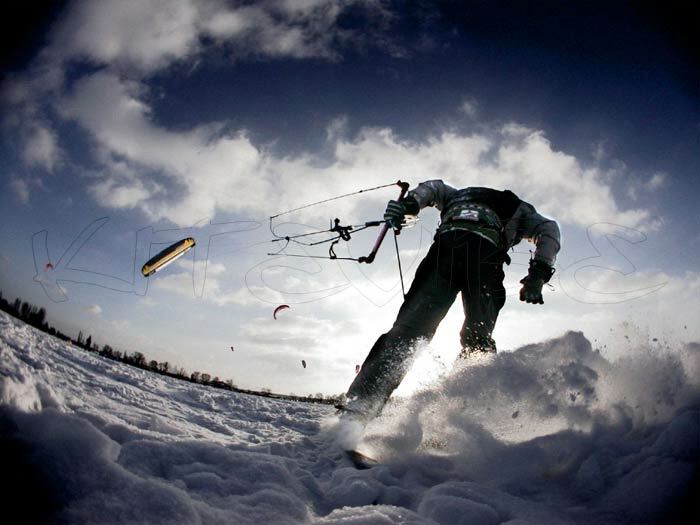 Occasionally I manage to escape London and this is what happened when I went over to Poland earlier this year for some snow kiting. Marcin, my dreadlocked host has invited me over to stay in his place in Poland with his family and girlfriend Monika. "It'll be ok. Lots of snow, space, everything. You see." He's the fixer. 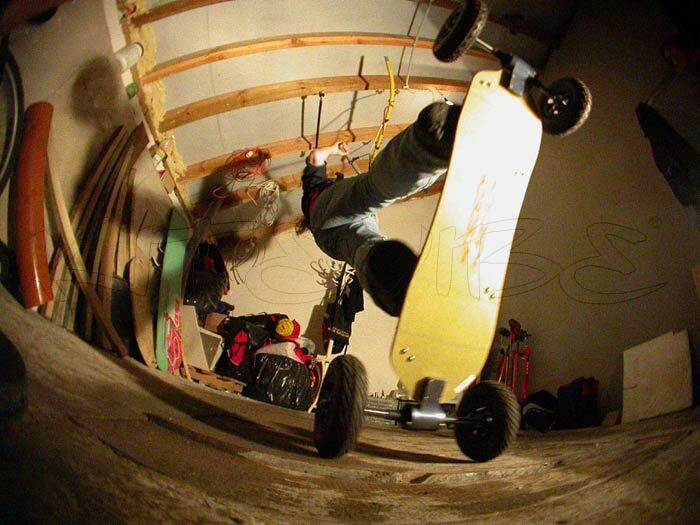 The man on the ground. And he's dead right. The hospitality in Poland is incredible and the homemade food is some of the best I've eaten. An empty plate here means you're still hungry, so if you’re coming, get ready to burn off large amounts running around in the snow. Three hours later after touch down and a drive from Gdansk airport and we’re already out on the snowy wastes of Malbork. It was a bit late shout but we needed to get out there. Everything was perfect. The wind, the snow and the sunlight all present and perfect. 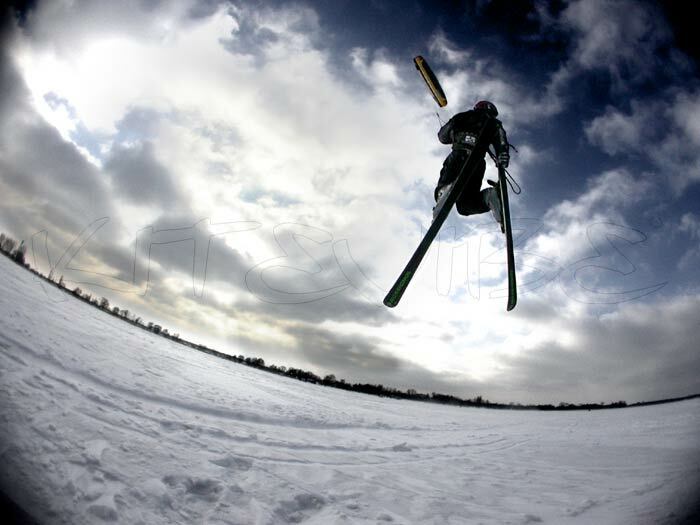 With conditions like this you have to take it as it might be the only good day. As you'll discover we needn’t have worried. Heading back to Marcin’s house I quickly learn not to leave anything lying around. Marcin's dog doesn't know any Polish, English, French, or German swear words but he apparently reckons that Gore-Tex gloves make excellent chew toys. Should I grow another finger I've now got the glove to match. Ok Day 2. I still haven't managed to get the polish for 'thanks, that's great, I've eaten a house' but I'm working on it. Starvation isn't likely or possible here. With fridges like eastern block tardises the food just keeps on coming - and it's good. I phone Marcin who’s out getting his car license renewed. "You better get back here your mum's running out of food." -"I don't believe you." During breakfast Marcin's parents and I cover the important topics of the day. Food, marriage, past girlfriends, current girlfriends, work back home, family photos of everybody as babies and Marcin at school. In shorts. With a bowl hair cut. He's a little surprised that we manage to cover so much ground when I don't have two syllables let alone two consonants to rub together in polish. But I have pen and paper and I'm dangerous on the draw. There's a car, a church, some clocks to tell the time with and my stickmen are in mass employment. In fact they are escaping across the page in a variety of disguises. One even has dreads. Must be Marcin. 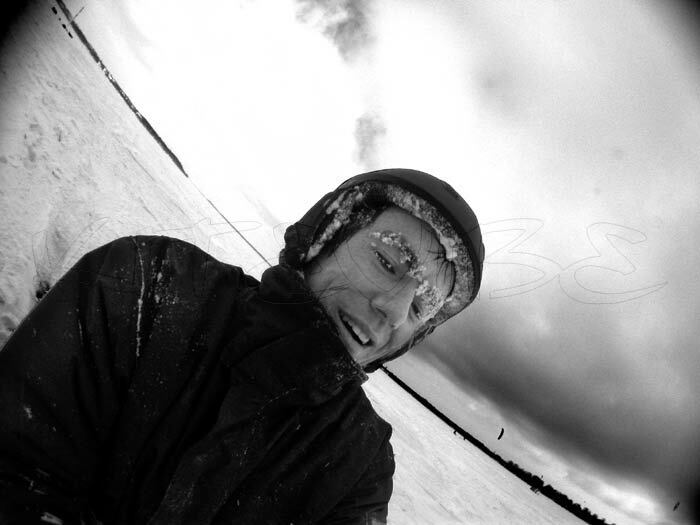 Marcin finally arrives and we hit the flat snowy fields of Malbork again. The snow must be a foot deep and deeper still in places. It's a cloudless sky and a steady 15mph on the wind meter. We set up camp. Neither of us can remember such smooth and steady inland winds before. These are farmer's fields and there's isn't a pylon or hedgerow in view. The wind is definitely beach-like. Lying back I dive the kite through the power zone and it pulls me straight onto my feet. Easy. 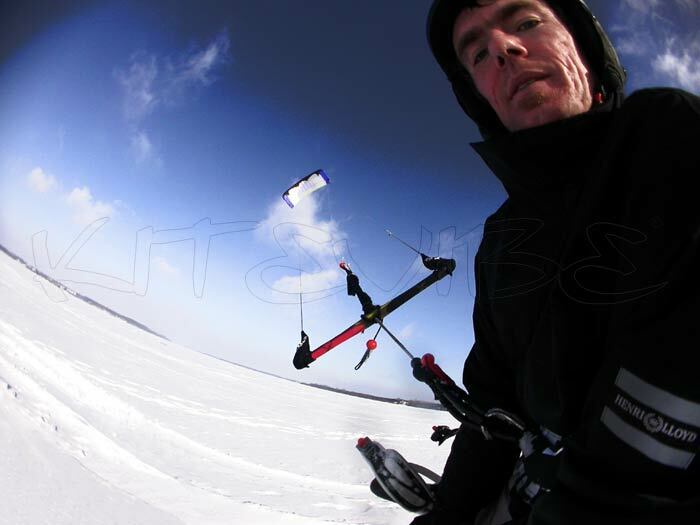 Coming to the end of my run I smartly redirect the kite back into the centre of power zone and bang that's it. There’s your afternoon sorted as was mine. With both of us using Frenzy’s they just seemed to eat up the sky. With the sun setting on a perfect second day we fly into an incredible blue twilight. 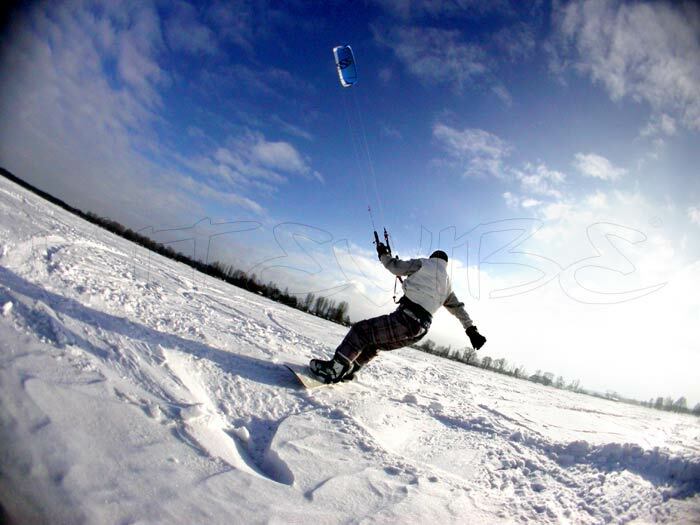 Once you're up snow kiting seems to be an ideal low wind sport (even if you might have to work the kite hard for the initial launch). I find myself making mental notes of what to do different next time (definitely cycling and sit-ups). As the sun finally dips its bruised head over the horizon it's time to make quick tracks as the temperature collapses and the wind chill soars. We get back to bowls of borscht. Borscht is what you want after an exciting yet draining day in the snow; hot Polish soup and some overgrown spicy sausage rolls. Katja, Marcin's mom and one woman food task force is cooking up another storm in the kitchen. I lose count of the courses. It's time for a snowy night drive into town. "Karo has a big screen" Marcin tells me and we're going to check out today's stills in the posh end of town on a working pc. Passing through the town, the buildings are those pastel eastern-block boxes you've seen in countless news reports. What remains of the skyline is dominated by a huge crusader-built gothic castle lurking in the distance. We pick up Monika at her apartment. Marcin points at the brick work. That's not crumbling mortar but unvarnished machine gun holes from a past which never seems to be too far away. Everywhere you look the landscape and municipal infrastructure seem to be at odds with the pole's amazing hospitality. What they have is yours. It's a challenge sometimes to take it. It's the fourth day and the sun has disappeared only to be replaced by a 15knot wind. 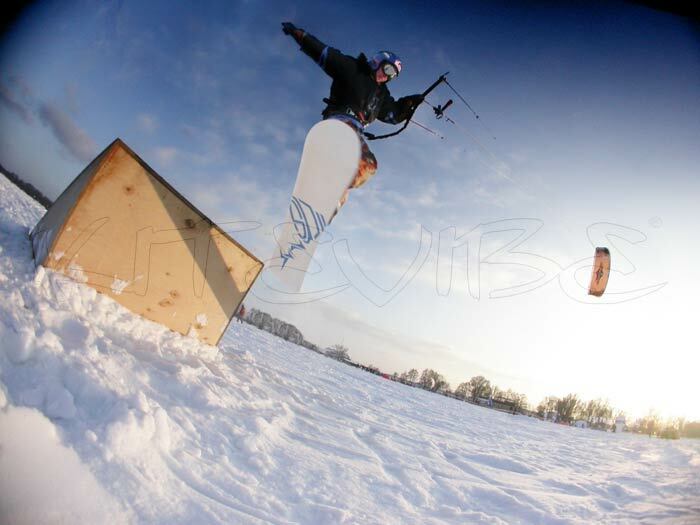 It’s a good deal colder than before and we’re carving at speed across the snow filled plains of Malbork. Like anything locals want to see what you're up to so they all come down for a look see. Of course as soon as Monika and Marcin's mums turn up the wind drops and the snow seemingly curdles. Twenty minutes later after they’ve gone the wind picks up and we’re back to the best afternoon we've ever had with long snaking runs and rooster tails. They'll just have to take our word for it. Four hours later of catapulting downwind and carving back up we're exhausted. Whoever said you can have too much of a good thing obviously wasn't available for comment today. We stop off and say thanks to Marcin's uncle (the land owner). We explain what newfound madness he's into, down the obligatory vodkas and head back to base. Later that night we're round at Monica's yahoo'ing photos to his brother. Don't count on a major IT backbone in Poland. Take everything you need electronics-wise in your hand luggage just in case. Fifth day is a rest day. Sort of. We're on a five hour road trip to Warsaw and the lakes. 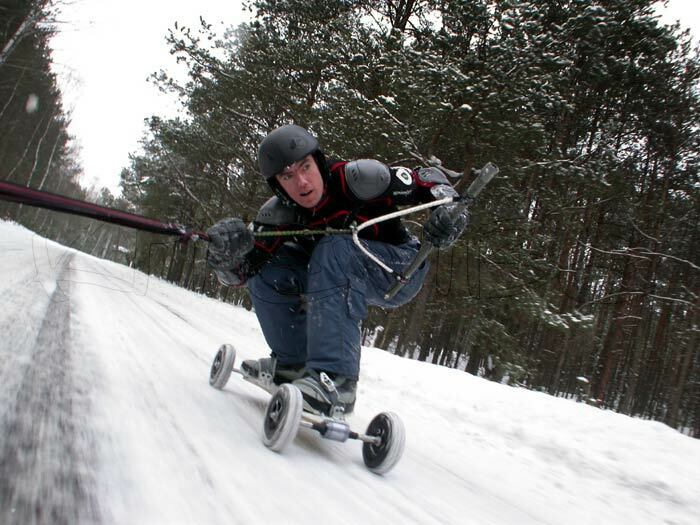 If you're ever driving in Poland we might want to catch some back episodes of wacky racers. There are no motorways here, only dual carriageways and A roads. It's quite something to watch an artic, a fuel tanker and a postal van all dancing in the outside lane before shaving past three other oncoming cars. After a while you get used to it. Cutting up isn't impolite. It’s a national pre-requisite. Four hours later and we've made good time. Rafal's house is the one you dream of but possibly could never afford. Set deep in the backwoods, forty minutes outside Warsaw, it comes complete with a fluffy german shepherd (the dog) and the kind of exquisite minimalist decor that'd make a city trader blush. Tomorrow the wind's forecast for 20kts. 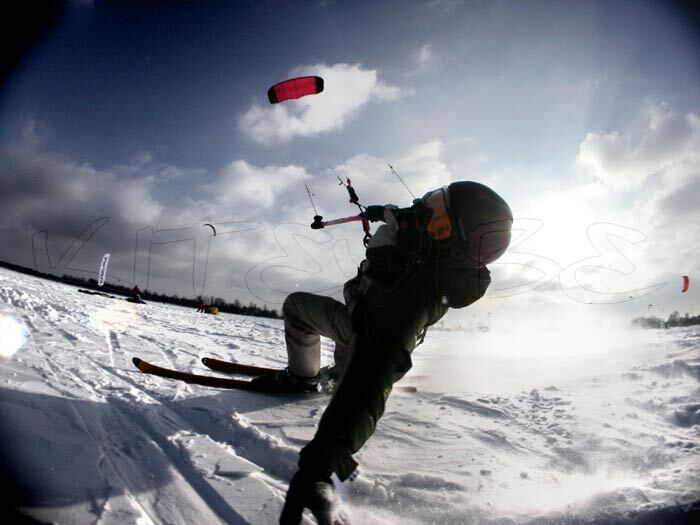 A deep filled snow location lies ready and waiting and everybody in the polish kiting scene's been invited. Should be quite a time. 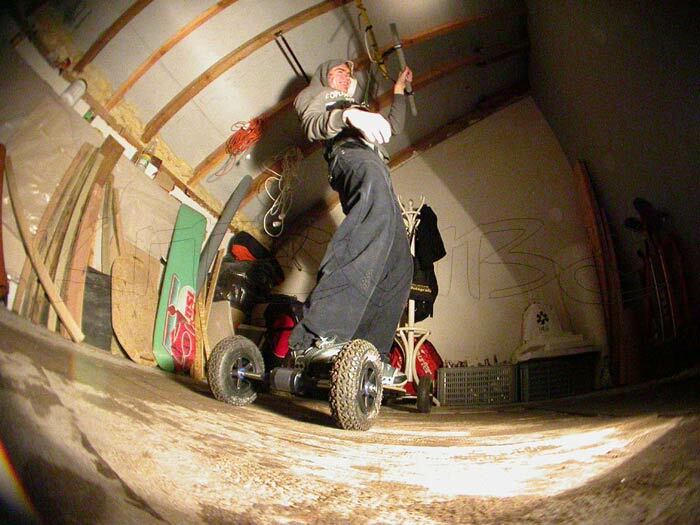 As a warm up we move into Rafal's garage where he's got a bar screwed into the ceiling to practise his aerial moves. We get the pre-production NXS out and set about touching the roof. 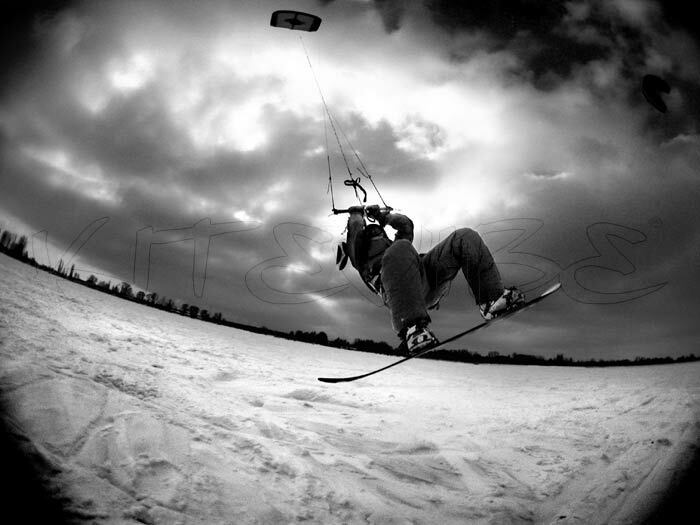 Rafal's (who also runs www.powerkite.pl) is the clear master at this and the pics show up his talent to great effect. After an hour of twists and spins our muscles need a break and the strop agrees by dumping me on the deck. Definitely time to stop. It's going to be another early start in order to get a full day in at the lakes. 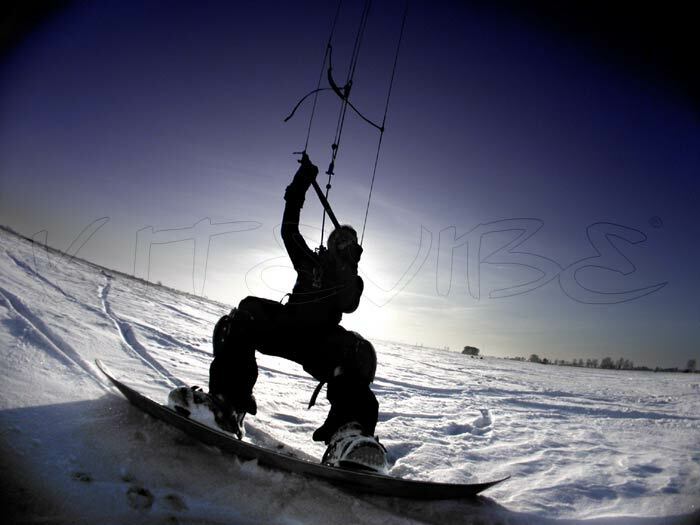 After an eggs breakfast we squeeze ourselves and our boards into a borrowed mercedes for a full-on day's snow kiting at Zegrzynski. The lake is only a ten minute drive from the house. And then out of nowhere it hits you. It's huge. The horizon bleeds into a vast plate of snow served up on a pool table layer of ice. And there's no one there. Not a soul. -How cool is this? We unload and disperse our kit onto the centre of the lake. 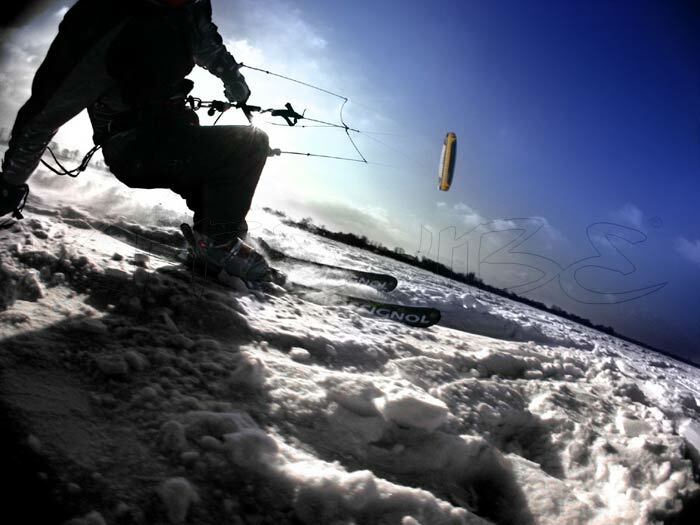 The wind's clean given the scale of the location and using our weapons of choice, two 10m Frenzy’s, a 13m Venom and a 14m X3 Naish LEI we proceed to scrawl our signatures across the snow covered lake. The snow is much more even than the fields of Malbork, but is only 9" thin and easily gives up the ice beneath. 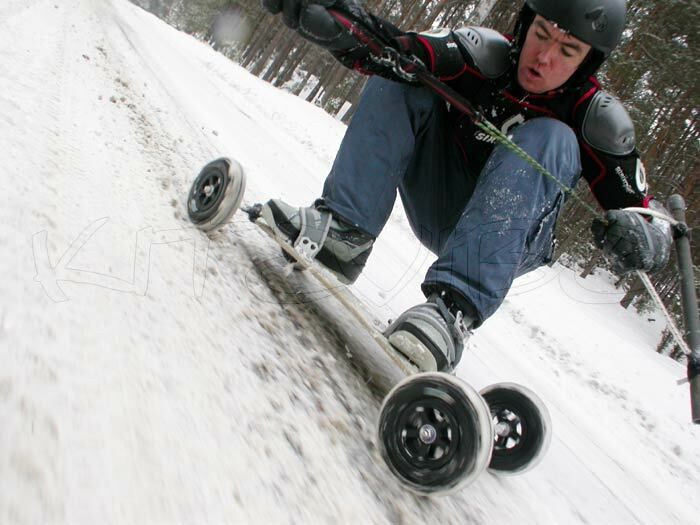 If you’re coming over get your boards sharpened beforehand if you don't want to lose too much ground downwind when you hit the ice. 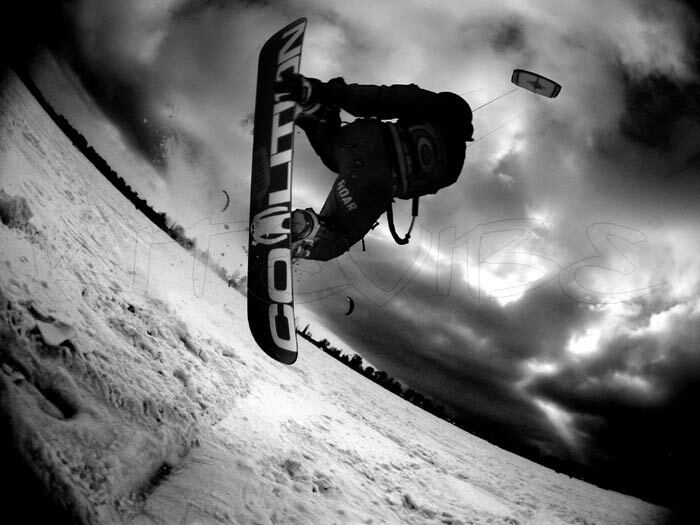 The ground can slip away at an alarming rate unless if you are on top of your game. It's definitely a different kind of thrill but you'll thank yourself that you bought decent body armour when you do come down to earth. As the morning gives way to the afternoon more of the ice gets exposed and it gets progressively more challenging. The thigh sapping long runs here are insane and more than make up for occasional buzz sawing you'll do across the ice patches. Basically, imagine two or three middle wallops all glued together, covered in snow and you'd be in the right place. And this is just one of the lakes on offer. 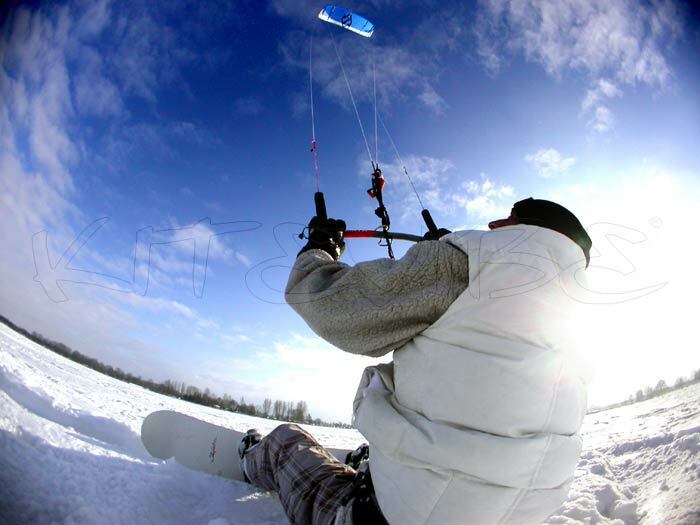 More and more snow kiters start to appear from the wooded fringes of the lake. It could be a scene from ‘Southern Comfort’ but what follows is the best kind of friendly fire. Tomorrow is the big kite fly-in with riders coming from all over. This looks like the dress rehearsal. Up go the hoardings, the marquees and the PA. 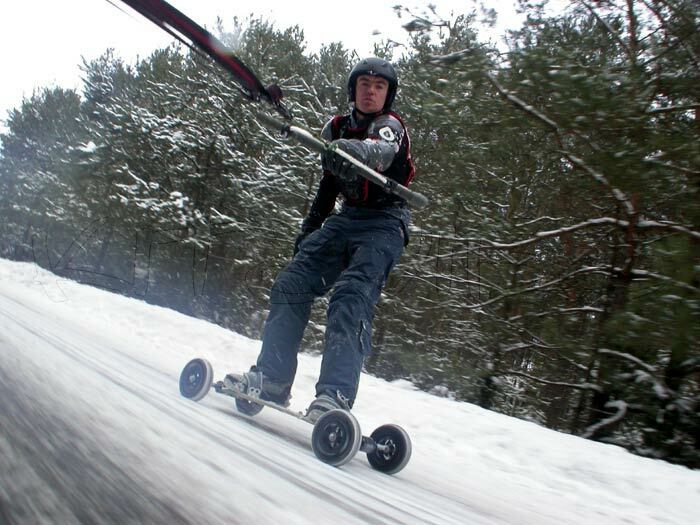 There's some guys with a tiny home made generator winching in guys on snow boards. Turn your head again and sly Red Bull girls are scoping the riders and passing out product to thirsty snow kiters. Skip ahead to the next paragraph if you want to as we settle down for a somber night of beer, loud music and kite DVD’s. 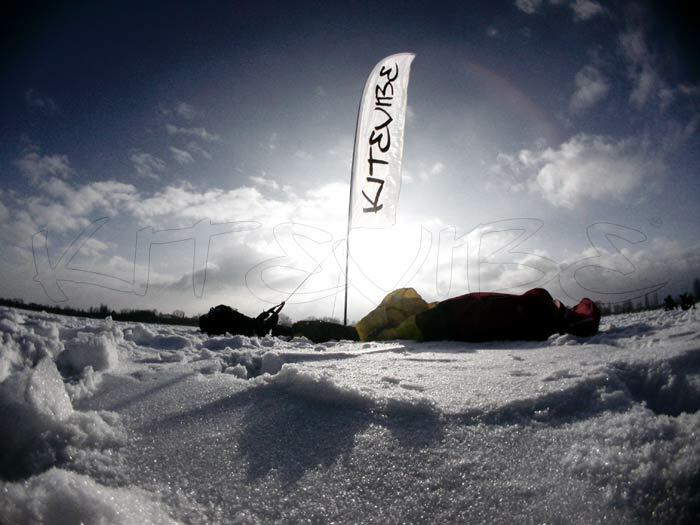 We're hoping to take the new Kitedeck NXS for a snow bath tomorrow. Has to be done. It’s morning and the sounds of wolves wake me. We're in the country after all. Beats cockerels. Wolves probably killed off all the cockerels to be honest. After breakfast we drive down to the lake and the great and gifted of Poland's power kite scene have gathered in a flotilla of SUV's and estates. The deep snow makes parking interesting as we slide our ride into a vacant spot. Weighed down like sherpas we make our way onto the lake to the PA strains of "baby, I want to be your lover". I won't bore with the rest of it because you've just heard the remaining verses and chorus. Jordan may still have shot at eurovision if this is the competition. The sound of the PA is blown back into the parking lot by the oncoming 18kph wind and it's a beaut. The sky dances in a shimmering panoply of coloured LEI's and de-powerable ram airs. 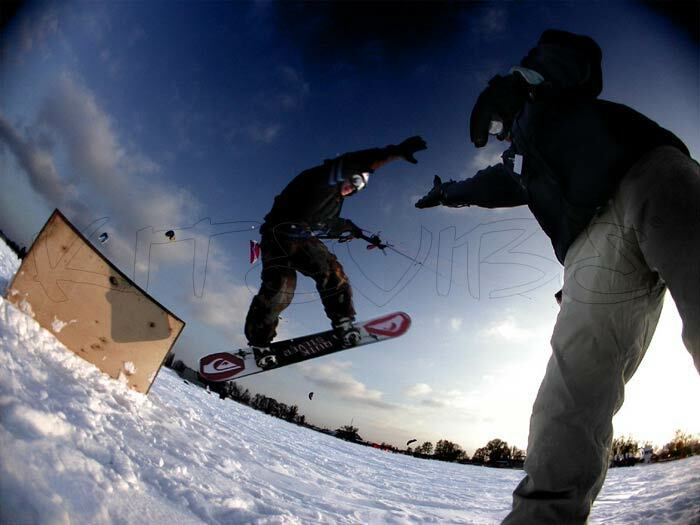 The competition hasn't started but it's fair to say that the free-ride area probably produces the best tricks of the day. 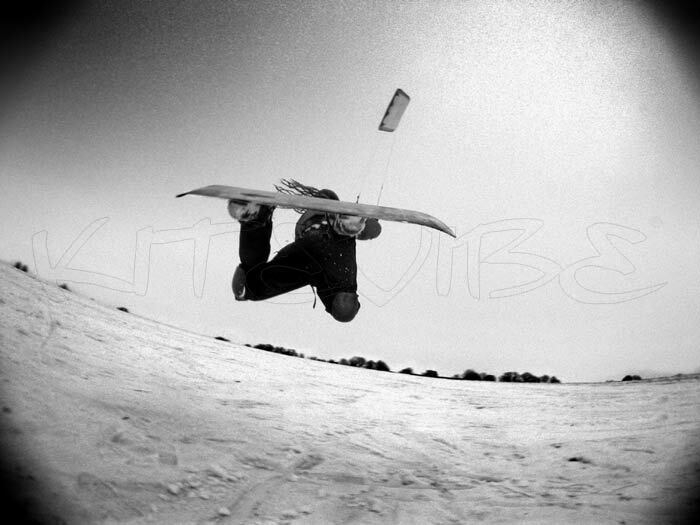 360's, blind sides, kite loops and more are all in effect with flyers launching from specially assembled rails and kickers. The sun burns up the morning haze and last night's snowfall swiftly becomes a moving carpet of flakes. Put your helmet down for a few minutes and you'll return to a ready-made ice bucket for your drink. Camera in hand, I carefully pick my way through the few more memorable bits of polish I can muster. Fortunately most of the local guys I run into speak great english. 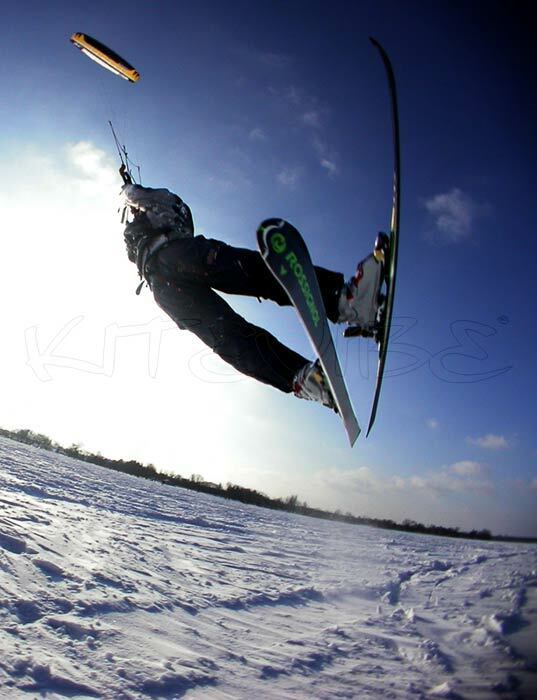 Thanks Szymek , Piotr, Adam, Kamil and everyone else for letting me take your photos. Rafal, my host later tells me I couldn't have managed to bump into any nicer guys on the Polish scene. I just followed the tricks to be honest. These guys may not be household names or the subject of regular magazine articles but there is plenty of talent out here and hopefully the photos will show that. Kamil tells me that they only get this combination of wind, snow and sun maybe three times a year. Even on a grey day I think you'd be hard pushed to find many places better for the airfare. Two memory cards later I realise I've spent nearly the whole day shooting pics and talking to people (which has been great by the way) but my camera now feels like a lump of frozen nitrogen and its time to head back to Rafal's ranch. Unfortunately the wind called it a day before the next day had even begun. In need of inspiration we get lost in the nearby woods. The morning sunlight casts a lattice of spiky shadows through the needle thin pine trees which tickles our brain cells. No wind. Have car. 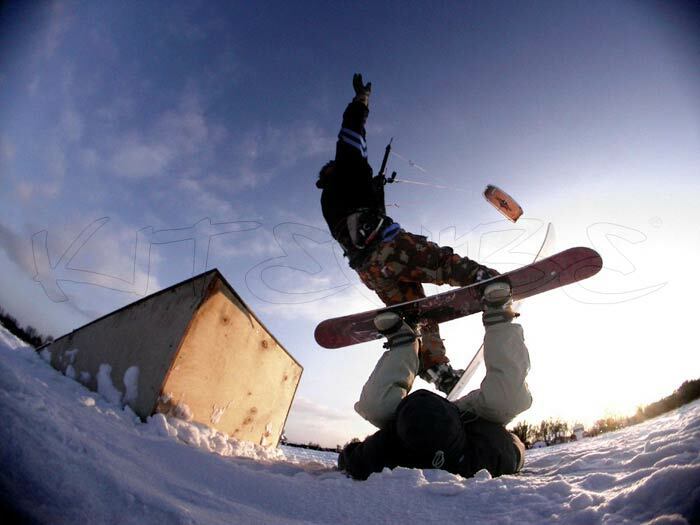 Have kitedeck NXS. A plan was falling into place. Thirty minutes later we are towing Rafal down the back roads at speed and he's giving the NXS a good workout whilst I'm hanging out of the boot to get some pics. We've pumped the tyres nice n' hard and it's carving a treat. The new NXS really seems a very solid proposition. Yesterday we had a couple of polish heavies stamping on the deck after being leaving it out overnight in the minus 12. It won't ground out. I have to admit I'm a bit worried watching these two heavies going at it and was even role playing apologies in my head to Dave and Julie just in case. I needn't have worried. There's still plenty of pop and carve left in this board even if it looks like a frozen popsicle. The wind decides to put in a late appearance and the guys unpack their kites and take the NXS into the sky. Believe the hype. It's a seriously light board. Today's the trip back to Malbork and so it's farewell to the lakes as we load up the car. The frost has sugar-coated every branch and leaf, making the passing the view landscape surreal. Imagine the entire length of the Thames frozen rock solid and covered in snow. That's our view as we drive out of Warsaw back up the country. In the final two days the snowfall concedes into rain so we stock up with goodies and presents. In fairness it seems we've caught everything just right and couldn’t have really asked for better. With the temperature plummeting to -15, we toast the last night with ostrich egg vodkas, home made cherry brandies and cooked meats round a nearby neighbour’s house. 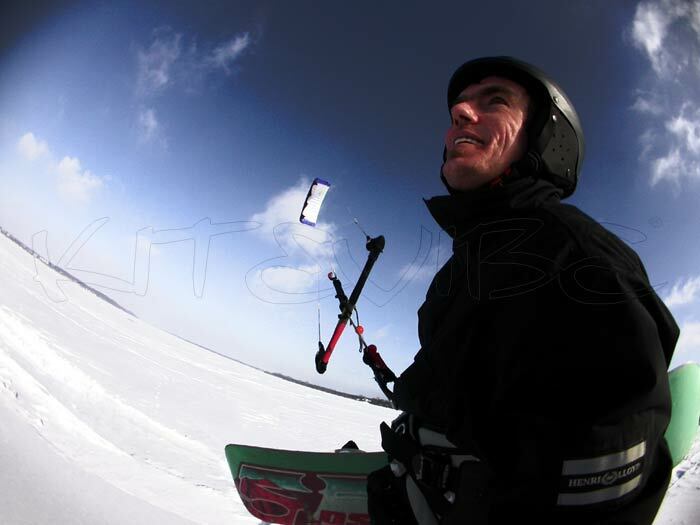 Glass in hand, it’s really hard to imagine snow kiting anywhere else at the moment.